Epson Stylus SX600FW is a stylish multifunction device ideal for home office or small business. It delivers clear printouts and attractive pictures. Epson Stylus SX600FW ink cartridges produces high capacity yields. The device appears fast and smartly styled for office users, providing ease of maintenance. The design of this device is attractive and sleek looking with smooth black finish and slanted top. It weighs approx. 8 kg and measures 461‎ x 346 x 297 mm . There is a folding ADF tray at the top of the device. It also has a 63 mm colour LCD panel and a series of control buttons which includes large navigation controls, up/down buttons for number of copies and resize buttons to zoom-in and zoom-out the documents. The control panel also has a standard number pad with quick dial fax numbers and last dial number dial. The device also incorporates four way mode button to switch between scan, copy, fax and photo print modes. The device supports memory card slots and PictBridge sockets for digital cameras. It also supports printing from flash drives. At the back, there is a USB socket for better connectivity options. Its useful Web-to-print utility, allows prints of websites to fit paper width, and the Event Manager, which enables you to assign specific applications to the Start, Copy, E-mail and PDF buttons. It also has an copy of Abbyy Finereader to handle Optical Character Recognition (OCR). The printing resolution of this device is 5,760 x 1,440 dpi and the scanning resolution is up to 2,400 x 2,400 dpi. 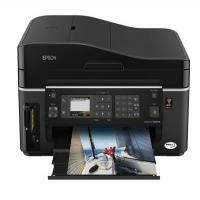 Epson Stylus SX600FW is a Wi-Fi standard multifunction printer with scan, copy, fax and photo print functions. The device supports USB for better connectivity option and also provides memory card slots and Pictbridge slot for creative printing. There are plenty of functions included in this device which includes Web-to-print utility, OCR feature and ADF support. Although, the device incorporates various functions but its high purchase price makes the user to think twice before going for it. Epson Stylus SX600FW ink cartridges are affordable and can easily be replaced. How to fix the print quality issues in an Epson Stylus SX600FW printer? The Epson Stylus SX600FW printer is an interesting piece of equipment in design terms. This feature-packed device offers fantastic levels of print quality with its high yield Epson Stylus SX600FW ink cartridges. It is particularly designed to fit nicely into a home office environment. Print head cleaning uses ink from all cartridges, so perform this step only if print quality declines. Once the process is completed, make a test print on the paper you inserted earlier. If still the print quality is not satisfying, we would recommend you to contact the Epson support. Q. My Epson scanner doesn't work since I upgraded it to Mac OS X Mavericks (10.9). What can I do? A. When using the Epson Scan version 3.7 or later on Mac OS X Mavericks (10.9) the program will crash and potentially display the error message. You will need to update your driver, using the Apple Software Update tool. To do this, click the apple icon and then click on the Software Update. Install any updates available for your Epson product. If the event occurs that an update is not available via this software then please use Apple’s Image Capture software. For information on how to use Image Capture, refer to the online user manual available. Q. Why should I prefer to use only high-quality Epson Stylus SX600FW ink cartridges for my printer? A. A high-quality Epson cartridge is used for preserving and delivering ink consistently. To produce quality printouts it is necessary to use only good quality cartridges for your Epson printer. The range of original Epson Stylus SX600FW ink cartridges uses the inks that are specially formulated to consistently produce good quality printouts and helps in preserving the long-term reliability of the printers. Also, one can buy the compatible range of cartridges from the site, as these are the refilled cartridges filled up by the professionals and guarantees to produce same quality printouts as originals. Q. When there is need for printhead alignment? A. When the printouts become faint, light or blurry, you may notice a misalignment of the vertical lines. Also, when you see dark or light horizontal bands, you will need to align the printheads to regain its print quality. Q. What is the ink capacity of the Original Epson Stylus SX600FW ink cartridges supplied? A. The ink volume of the original cartridges is around 5.5ml for each of the colour cartridges and 7.4ml for the black colour cartridge. Q. My printouts are missing the colour and coming out only in black. What can I do to resolve the issue with my Epson Stylus SX600FW? Check the printer software and make sure it is not set to use black ink only. Your printed colours can never exactly match your on-screen colours. However, you can use a colour management system to get as close as possible. Try using the ICM (Windows) or ColorSync (Macintosh) setting. Q. Can I store Epson Stylus SX600FW ink cartridges for a long time - as I was planning on bulk buy (to buy several packs) at suitable prices? A. The minimum shelf life of cartridges is about 6 months. The only risk to store the cartridges for a long time is that the ink inside will start drying up. If stored correctly in cool and dry place, and used before expiry date printed on the cartridges, Epson Stylus SX600FW ink cartridges should work fine with your printer. Q. Where can I buy the Epson Stylus SX600FW printer on this site? A. Unfortunately, we sell only ink cartridges for Epson Stylus SX600FW printer. We currently do not sell the printers on this site. For more details, you can try to log onto the Epson official site. Q. What to do when Epson Stylus SX600FW printer produces blank paper outputs? A. The blank printout problem can be caused by, either dried out Epson Stylus SX600FW ink cartridges or by clogged printheads. Try cleaning up the printheads to unblock the nozzles. If the issue does not resolve you can try replacing the ink cartridges and try printing again. Make sure you replace the cartridges without turning the device off. Otherwise, the printer would not be able to read the new cartridges and display an error message. In any case, feel free to call our customer support services on +44(0)28 308 33221 or email us at info@printerinkcartridges.ie and we will try to troubleshoot the problem. Q. My Epson Stylus SX600FW is continuously showing paper jam error, however, there is no paper. I have to restart the printer but still showing the same issue. A. This error message is shown by the printer when the paper is jammed in one or more locations. To resolve the issue open the top most cover of the printer, remove the jammed paper, check out the entire paper path for any piece of paper. Verify for the flags and sensors. Turn off the printer and turn it on again. If the problem still arrives, the cause of the error message could be a broken sensor or sensor lever. Q. I own an Epson Stylus SX600FW printer which has recently started making weird image printouts with disturbed colour contrast. There are some uneven lines on the prints and colours are also missing. Can you help me fix this problem? A. These are very common issues with Epson Stylus printers. You can check for the print head nozzles by using a Nozzle check utility on your computer, this will determine if any of the nozzles are blocked. You should also check the purchase date of these Epson Stylus SX600FW ink cartridges, as if they were bought long ago they could have started drying and can produce printouts with low quality.